Posted 4/21/2015 8:32pm by Sam Bellamy. Sarah will be at Myrtle's Market on Joe White avenue in Myrtle Beach Wednesday! The season still continues to be slow but with sunshine somethings are looking up. What is at the markets? At both markets ( the Farm and Myrtle's market ) some strawberries, nice kale, three varieties of romaine lettuce, green star, two star lettuce, new red fire, concept and Cherokee are semi romaine types. This should satisfy for some interesting salads. Green onions are beginning fairly strong now. At the market with Sarah, she will have limited amounts of organic asparagus, radish, kohlrabi, kale, lettuce and strawberries as well. Posted 4/14/2015 5:47am by Sam Bellamy. We are picking some strawberries for the market. We have considerable set back on the Pick Your own field due to December deer damage. We are having to wait to see how the crop responds. Unfortunately, this means for us PYO will be late this year. 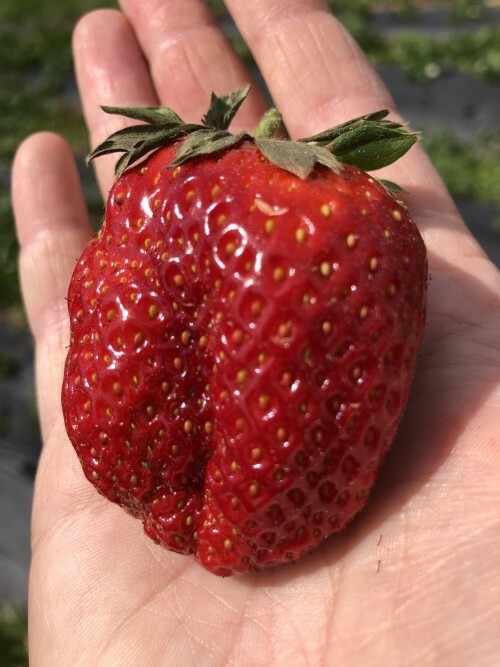 In 34 years of growing strawberries we have never had to face this kind of challenge. Please bear with us. We have strawberries at the market. Our greens are really benefiting from this weather! We have some great kale right now. The lettuce and Kohlrabi are right behind it. Broccoli and cabbage are right around the corner. Organically, the strawberries are really pretty. The lettuce is in it's prime. Green onions are available. A few mushrooms are coming in, a little dandelion maturing, radishes are not far off. Kale, broccoli, kohlrabi are coming soon. If you are interested in organic produce it is best that you set up a time for pick up and let us hold it for you. Thanks. Posted 4/5/2015 1:19pm by Sam Bellamy. Good news, we will be opening Tuesday. It will likely be a slow start as many things are still behind schedule but they should be coming soon as well. Posted 3/21/2015 7:42am by Sam Bellamy. Happy long awaited Spring! I find it hard to express just how glad I am to have Spring weather. Many of you have asked when are we opening and when will the strawberries be ripe. I have been slow to answer because I don't want to tell you something that may be misleading. Opening most likely before the end of this coming week. Still not exactly certain. Things are behind in the field and we would want more to offer but some of the crops are getting there. Strawberries are really behind. We will have some likely first week in April but PYO will definitely be later this year. My hope is that this weather will provide some compensation. Thanks for your patience and for wanting to support us. It is important to us that we not just be a business that sells but actually serves you in ways that are meaningful and good. Posted 12/22/2014 7:14am by Sam Bellamy. We wish you a Merry Christmas and to let you know that the market will close at 1:00 pm Tuesday. We will open back up in 2015 closer to February. During this time we are asking that you call if you want some items from the farm. Posted 12/15/2014 1:23pm by Sam Bellamy. Well glad tidings seems very appropriate since we were just able to restore our email. We have not been able to send any news from hear until we enlarged the capacity. So if you have not put in an order for baked goods yet, please know we are still taking orders. I would not wait too late since we need to gauge our inventory closely. We have some really nice pecans that we have shelled ourselves. If you are looking for quality nuts that have been carefully shelled then check us out. Sweet potatoes, greens, onions, turnips, kale are still available. The produce market has lots more items and some very good Christmas ideas such as jams , chows, preserves and gift certificates. Posted 12/13/2014 11:28am by Sam Bellamy. Our email service is experiencing difficulties so I haven't been able to email updates. The bakery and produce market are open. Please let us know how we can serve you especially if you want baked goods for he Holidays. Posted 12/8/2014 8:35am by Sam Bellamy. The Produce & Bakery are still open. Please try to place your orders for the Bakery early so they will better know how to plan. It is a slow season right now for the produce but a good time for some items and to be able to talk about any questions you may have about produce. Posted 11/23/2014 8:51pm by Sam Bellamy. I am impressed how much gratitude and thanksgiving are emphasized in the Good Book. It seems that God knows it really does do us good to acknowledge the good and the right. It is one reason why I like real farm goodness. It isn't something we say, it is something I believe in. Each day I grow to appreciate new knowledge about just how good food can be. Amazed at not only seeing awe and wonder but tasting them. Like old friends introducing me to something new the richness of life adds more layers of gratitude. Oh yeah... I am suppose to tell you that the market will close at 1pm on Wednesday. So be sure and pick up your orders by noon. Do have a Happy Thanksgiving! Posted 11/7/2014 5:02am by Sam Bellamy. We have just made apple cider. We also managed to save some crops from the cold weather last weekend. There is organic eggplant, organic peppers, mushrooms, beans and green tomatoes. Now is the time to place orders with the bakery for the Thanksgiving Holiday.